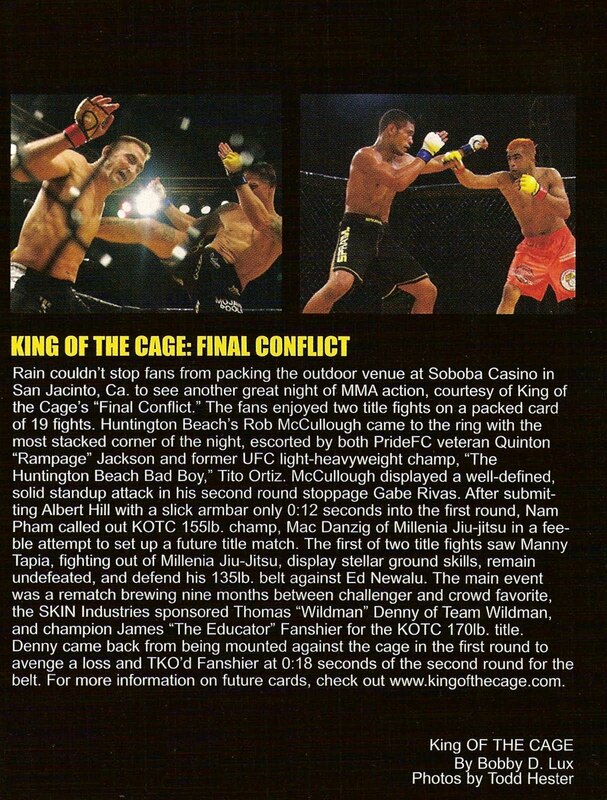 This is a write up of mine that covered a King of the Cage mixed martial arts event held at Soboba Casino. This originally appeared in Skinnie Magazine. Rain couldn’t stop fans from packing the outdoor venue at Soboba Casino in San Jacinto, Ca. to see another great night of MMA action, courtesy of King of the Cage’s “Final Conflict.” The fans enjoyed two title fights on a packed card of 19 fights. Huntington Beach’s Rob McCullough came to the ring with the most stacked corner of the night, escorted by both PrideFC veteran Quinton “Rampage” Jackson and former UFC light-heavyweight champ, “The Huntington Beach Bad Boy,” Tito Ortiz. McCullough displayed a well-defined, solid standup attack in his second round stoppage Gabe Rivas. After submitting Albert Hill with a slick armbar only 0:12 seconds into the first round, Nam Pham called out KOTC 155lb. champ, Mac Danzig, setting up a future title match. The first of two title fights saw Manny Tapia, fighting out of Millenia Jiu-Jitsu, display stellar ground skills, remain undefeated, and defend his 135lb. belt against Ed Newalu. The main event was a rematch brewing nine months between challenger, and crowd favorite, Thomas “Wildman” Denny and champion James “The Educator” Fanshier for the KOTC 170lb. title. Denny came back from being mounted against the cage in the first round to avenge a loss and TKO’d Fanshier at 0:18 seconds of the second round for the belt.